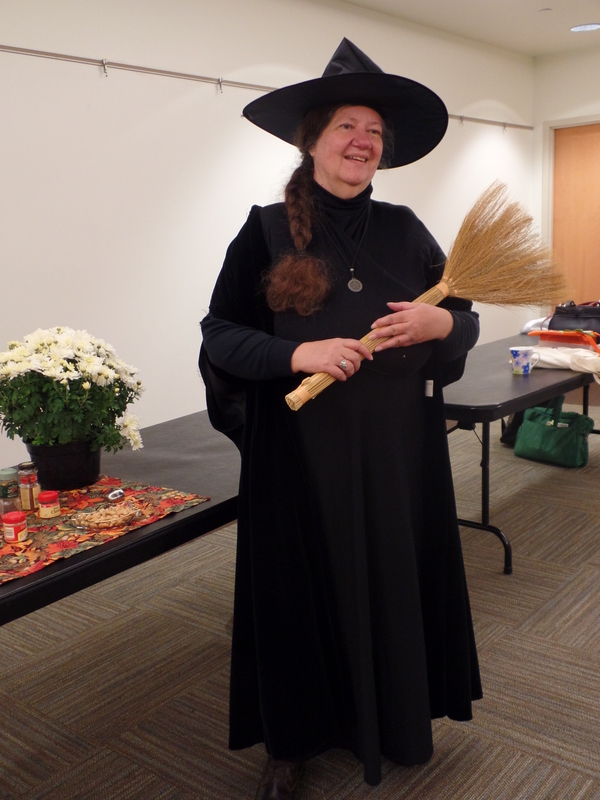 The second Herbs of Halloween talk was scheduled for this morning. Once again, I gathered my goodies, mounted my broom, and made my way to a public location to spread the joy with a group of people. OK, I drove the car rather than the broom. This gathering was a smaller garden club than the first one. They met in the library, and they served lunch. In honor of my visit, one of the members had carved a pumpkin with the profile of a witch flying on a broom. It was expertly carved and beautiful to see. I immediately said that the image looked just like me. The ladies (and one gentleman) thought that was funny, and we were off to a happy start. Each group is different. This group became very interested in the spices. (I have no other place to put spices in my Herbs talks, so we cover them here.) Gardeners are familiar with plants, but this gave them an opportunity to closely examine the nuts (nutmeg), bark (stick cinnamon), and dried buds (whole cloves) of the spices. I was also pleased to see how carefully they smelled the spices as they were being passed around. Aroma was one of the two themes of the talk, and I could tell how closely they were following the program by their interactions with the items I brought. Oh, and none of them had ever cut an apple cross-wise. The star was a complete surprise to them. After the talk, the cameras came out. I am always embarrassed when that happens. Samedi, the things I do for you.